A stirring, eloquent commentary on contemporary Americans— spiritual condition. 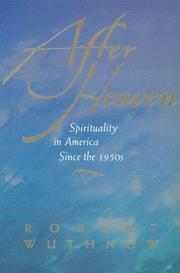 Why do millions of Americans claim they are spiritual but not religious? This contemplative interpretation by leading sociologist of religion Wuthnow (Sociology/Princeton; God and Mammon in America, 1994, etc.) postulates that while the 1950s and earlier eras promoted a spirituality of dwelling (tied to a particular place of worship and to the family), the post-1960s era has emphasized one of seeking. The religious journey has become somehow more important than actually arriving (or staying) in any one place. It’s not just that Americans no longer opt for longtime commitment to religious institutions; it’s a fundamental paradigm shift proclaiming that the individual spiritual quest is more meaningful than religious community, and that Americans now understand the sacred to abide in themselves, not in traditional establishments. If all this smacks of the ’60s, it’s with good reason: one of the most cogent arguments of this book is that the legacy of the ’60s has profoundly affected not only the immediate participants in the upheavals of that decade, but all Americans. In the 1990s, for example, we see the ephemeral seeker of spirituality of the ’60s come to a logical conclusion in our cultural obsession with angels: when angels visit, they don—t demand that we go to church, make lasting spiritual commitments, or change our behavior in any way. Such encounters are brief, subjective, and almost always therapeutic, like ’90s spirituality. Wuthnow shows that, as God has become less immediately a part of our cultural —geography,— we rely more heavily on friendly intermediaries. Angels thus demonstrate the anxieties many Americans have about God, not an upsurge in new religious sentiment. Occasionally preachy (especially about why Reagan was the perfect symbol of the shallow spirituality of the ’80s), but always subtly perceptive, this is essential reading for anyone wishing to understand noninstitutional religion in America.